The new electric carmaker reveals its first volume model. Ever since Swedish performance brand Polestar revealed its first car, the Polestar 1, we've been eagerly awaiting a sequel. Unlike the limited-edition Polestar 1, which is a 600 horsepower hybrid luxury coupe, the Polestar 2 is a premium five-door fastback meant to stick it to Tesla. Polestar says this is the first car to truly compete with the Tesla Model 3 in the broader and increasingly progressive EV segment. "Polestar 2 is our first fully electric car and first volume model. Everything about it has been designed and engineered with passion and dedication. As an electric performance brand, and through the forthcoming launch of a portfolio of fully electric cars, Polestar is determined to address the world’s air quality challenges. Polestar delivers electric performance cars that are great to own and drive,” says Thomas Ingenlath, CEO of Polestar. Let's start with the most important headline of any EV reveal - the range. The official range hasn't been quoted but Polestar says it is targeting 500 kilometers (310 miles), which is identical to the longest-range Tesla Model 3. Unfortunately, EPA estimates are only expected to rate the Polstar 2 at 275 miles, falling shy of the magic 300 number. Two electric motors are mated to a 78 kWh battery, which is housed within the floor of the Volvo Group's Compact Modular Architecture platform (CMA). This architecture is not only good for packaging but it also reduces noise, vibration, and harshness. As with battery range, charging is an important decision for any EV owner and Polestar says it's setting up strategic collaborations to give Polestar 2 owners easy access to public charging networks around the world. We don't know if Polestar will be able to match the volume of Tesla's supercharger network but with a range nearly 300 miles, charging may not be such a significant issue. Polestar has yet to provide details about charging times. 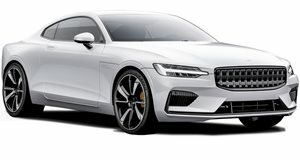 Polestar claims the all-wheel-drive drivetrain produces a total output of 400 horsepower and 487 lb-ft of torque and is capable of a 5.0-second 0-60 mph time. Polestar will also sell an optional Performance Pack, which includes Ohlins dampers, Brembo brakes, and unique 20-inch forged aluminum wheels. The Performance Pack also boasts gold seat belts, brake calipers, and valve caps. We expect this won't be the last version the Polestar 2, so perhaps a more affordable short-range version will arrive eventually alongside a more powerful variant. Stepping inside, the Polestar 2 dazzles with simplistic yet elegant interior, centered around an all-new, Android-based infotainment system. The Android operating system will enable embedded Google services such as Google Assistant, Google Maps (with support for EVs), and the Google Play Store, all controlled on an 11-inch touchscreen. And if you wan to avoid fingerprints on the screen, Google's excellent natural voice control is also available. Further sticking with the times, Polestar's interior is completely free of animal materials. "We decided to bring something different to the segment. Our avant-garde design has evolved from Polestar 1 into an edgier, bolder statement. We have also designed a standard vegan interior with progressive textiles that will appeal to the forward-thinking audience who will subscribe to Polestar 2," said Maximilian Missoni, head of Design at Polestar. The Polestar 2 will start at $63,000 for the Launch Edition (the first 12 months of production) in the US, plus the $7,500 tax incentive, which effectively brings the price down to $55,500. The Tesla Model 3 Performance is a tad cheaper at $60,900 but is no longer eligible for the full $7,500 tax credit. We expect the non-Launch Edition models to be less expensive but Polestar hasn't quoted a price as of this writing. As with the Polestar 1, buying a Polestar 2 will be handled online and will likely be made available as a subscription. Preorders are currently open and production in China is set to begin in early 2020 for both left-hand and right-hand drive markets. The initial launch markets include China, the US, Canada, Belgium, Germany, the Netherlands, Norway, Sweden, and the UK.